In addition to immune cells, many other cell types are known to produce cytokines. Cultured normal mouse gallbladder epithelial cells, used as a model system for gallbladder epithelium, were examined for their ability to express the mRNA of various cytokines and chemokines in response to bacterial lipopolysaccharide. The synthesis and secretion of the tumor necrosis factor-α (TNF-α) protein by these cells was also measured. Untreated mouse gallbladder cells expressed mRNA for TNF-α, RANTES, and macrophage inflammatory protein-2 (MIP-2). Upon treatment with lipopolysaccharide, these cells now produced mRNA for Interleukin-1β (IL-1β), IL-6, monocyte chemoattractant protein-1 (MCP-1), and showed increased expression of TNF-α and MIP-2 mRNA. Untreated mouse gallbladder cells did not synthesize TNF-α protein; however, they did synthesize and secrete TNF-α upon treatment with lipopolysaccharide. Cells were treated with lipopolysaccharides from 3 strains of bacteria. Qualitative and semi-quantitative RT-PCR, using cytokine or chemokine-specific primers, was used to measure mRNA levels of TNFα, IL-1β, IL-6, IL-10, KC, RANTES, MCP-1, and MIP-2. TNF-α protein was measured by immunoassays. This research demonstrates that gallbladder epithelial cells in response to lipopolysaccharide exposure can alter their cytokine and chemokine RNA expression pattern and can synthesize and secrete TNFα protein. This suggests a mechanism whereby gallbladder epithelial cells in vivo may mediate gallbladder secretory function, inflammation and diseases in an autocrine/paracrine fashion by producing and secreting cytokines and/or chemokines during sepsis. The biliary system is more than a passive conduit transporting bile from the liver to the intestines. Hepatic bile is actively modified by the epithelial cells that line the bile ducts and gallbladder. Biliary epithelial function is partially under the control of secretin and vasoactive intestinal peptide . Other extracellular agonists that influence biliary function include neuropeptides [2, 3], ATP [4, 5], and bile salts . In addition to the well-documented role that cytokines play in the immune response and inflammation [7, 8], cytokines also modify the functioning of epithelial cells. For instance, tumor necrosis factor-α (TNF-α) can modify intracellular signal transduction and regulate ionic channel activities in various epithelial cells . A few studies have shown that cytokines can alter biliary epithelial cell function [10, 11]. Biliary epithelial cells are capable of producing a great variety of physiologically active compounds. For example, it has been shown that biliary epithelial cells synthesize nitric oxide, a strong vasodilator , and endothelin-1 , a potent vasoconstrictor. Various cytokines are also produced by biliary epithelial cells . As biliary epithelial cells are capable of both producing and responding to cytokines, these cells may use cytokines for the autocrine/paracrine regulation of their own function as well as that of other cells. Bile in the biliary ducts and the gallbladder often contains bacteria and the bacterial product lipopolysaccharide (LPS). This may be due to ascending infection from the intestine or descending infection via portal venous blood [15, 16]. Bacterial infection usually leads to activation of the immune system followed by inflammation. While inflammation is an important element in the defense against infection, it can also contribute to cholestatic biliary diseases and cholelithiasis. Therefore, the control of the immune and inflammatory response of biliary tissue to bacteria is important in determining disease progression. While the biliary epithelium can act as a physical barrier to limit bacterial infection of the underlying tissue , its physiological response to bacteria and bacterial products is not well characterized. Like pulmonary and intestinal epithelial cells, biliary epithelial cells might respond to bacteria in bile by producing cytokines and other factors. To test this hypothesis, we used cultured normal mouse gallbladder epithelial cells (MGBE) as an in vitro model system to examine the ability of gallbladder epithelium to produce mRNA for various cytokines and chemokines. The synthesis and secretion of TNF-α protein was also measured. These cells demonstrated distinct changes in their cytokine and chemokine mRNA expression profile and TNF-α protein production in response to LPS. Analytical grade chemicals and tissue culture supplies were obtained from Sigma Chemical Co. (St. Louis, MO), except where noted. Vitrogen (bovine dermal collagen) was purchased from Collagen Corp. (Palo Alto, CA). Transwell inserts (24 mm diameter, 3 μm pore size) were purchased from Corning Corp. (Acton, MA). MGBE were grown as previously described . In brief, MGBE were grown on Vitrogen-coated Transwell inserts suspended above human gallbladder myo-fibroblast feeder cells. The cells were fed with Eagle's minimum essential medium containing 10% fetal bovine serum, 2 mM L-glutamine, 20 mM HEPES, 100 IU/mL penicillin, 100 μg/mL streptomycin, plus Insulin-Transferrin-Sodium Selenite Media Supplement, MEM-vitamins, and MEM-non-essential amino acid solution (Sigma Chemical Co.). Confluent MGBE have well-differentiated morphology and high transepithelial electrical resistance (163 Ω/cm2) . Prior to each experiment, Transwell inserts with confluent MGBE were transferred to new plates without feeder cells. Confluent MGBE were fed serum-free medium. 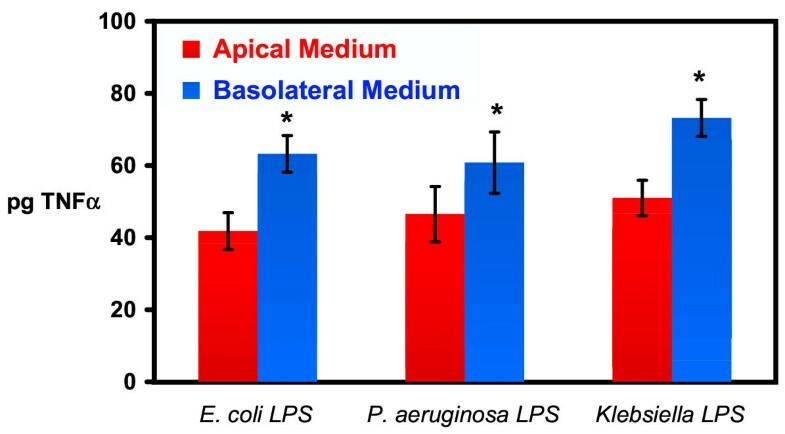 Cells were treated with LPS from E. coli (serotype 0111:B4) or Pseudomonas aeruginosa (serotype 10) at 100 μg/mL, added to the apical compartment of the insert. After two hours, the cells were harvested by trypsinization, and total RNA was extracted using TRIzol reagent (Gibco BRL, Gaithersburg, MD). Five μg of total RNA was reverse-transcribed according to the manufacturer's protocol (Superscript II Preamplification System, Gibco BRL) using oligo (dT) as primer. cDNA prepared from 0.5 μg RNA was subjected to PCR using murine gene-specific primers for 8 different cytokines and chemokines (Table 1) as previously detailed . All of the primer pairs spanned at least one intron in the corresponding genomic DNA. Positive RNA controls were performed previously to confirm specificity of primer pairs (data not shown). Negative controls were performed by omitting the RT step or the cDNA template from PCR amplification. For qualitative PCR, target sequences were amplified at 56°C for 25 cycles; for semi-quantitative PCR, target sequences for TNF-α, IL-1β, and MIP-2 (CXCL2) were amplified at 56°C between 22 and 32 cycles in order to yield visible products within the linear amplification range. PCR products were separated by electrophoresis on a 2% agarose gel and stained with ethidium bromide. All RT-PCR bands at the expected size were also directly sequenced to confirm their identity. Glyceraldehyde-3-phosphate dehydrogenase (GAPDH) or acidic ribosomal phosphoprotein (ARP) were used as internal controls. Confluent MGBE were fed serum-free medium, with or without LPS added to the apical side (LPS concentration = 2 or 100 μg/mL). Medium from the apical and basolateral compartment was collected separately at measured intervals and immediately frozen at -70°C. The cells were lysed with 1% NP-40 buffer (150 mM NaCl, 50 mM Tris, pH 8.0) containing 100 μg/mL phenylmethylsulfonyl fluoride and 1 μg/mL aprotinin, sonicated for 30 seconds, then frozen. TNF-α was measured in cell lysate and undiluted medium using the Mouse TNF-α Immunoassay Kit from R&D Systems (Minneapolis, MN). Statistical analysis on the TNF-α immunoassay data was performed using Student's t-test. Cell viability was assessed by measuring lactate dehydrogenase release into the medium, as previously described . Changes in transepithelial permeability was measured using 3H-mannitol as a small molecular weight probe. Tritiated mannitol (2 μCi) with cold mannitol (0.15 mM) was added to the apical medium and samples of the basolateral medium harvested and counted at 1, 2, 4, and 24 hours after LPS treatment. 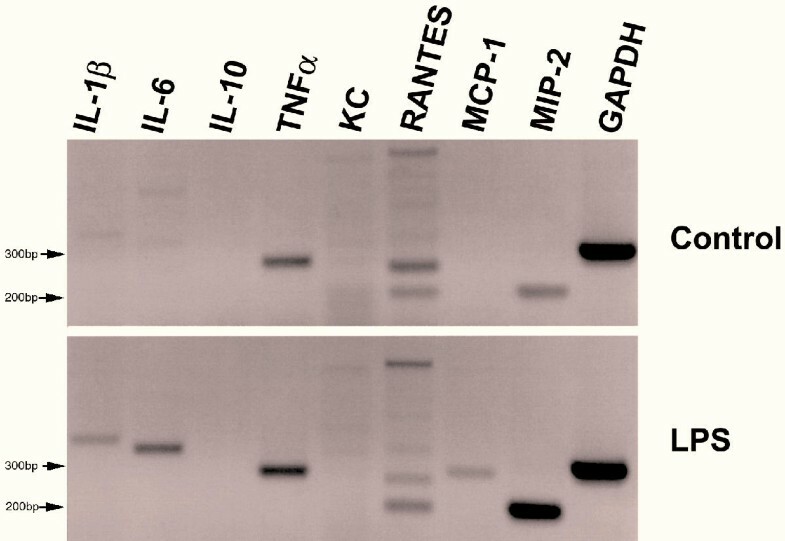 Using cytokine/chemokine-specific primers with RT-PCR, untreated MGBE showed distinct bands representing mRNA of TNF-α, RANTES (Regulated on activation, normal T cell expressed and secreted) (CCL5), and macrophage inflammatory protein-2 (MIP-2/CXCL2) (Figure 1). 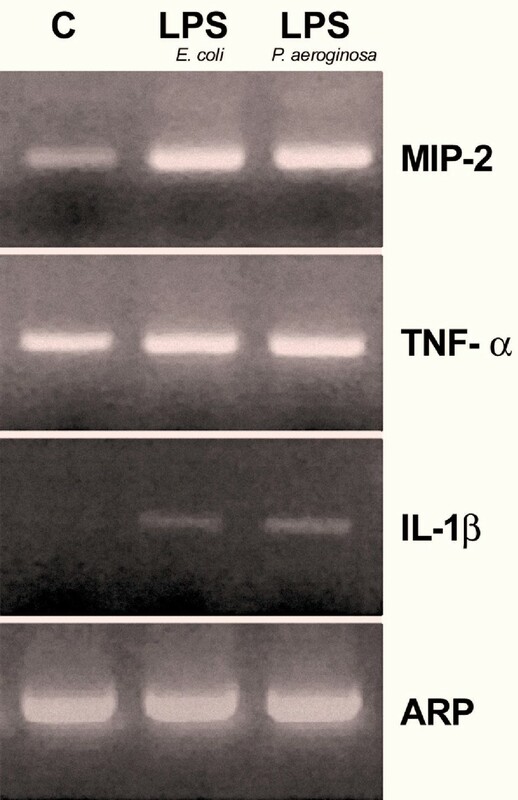 Upon apical treatment with LPS from E. coli for two hours, these cells additionally produced mRNA for interleukin-1β (IL-1β), IL-6, and monocyte chemoattractant protein-1 (MCP-1/CCL2). There was no detectable expression of IL-10 or KC (murine GRO-α/CXCL1) mRNA before or after LPS treatment. 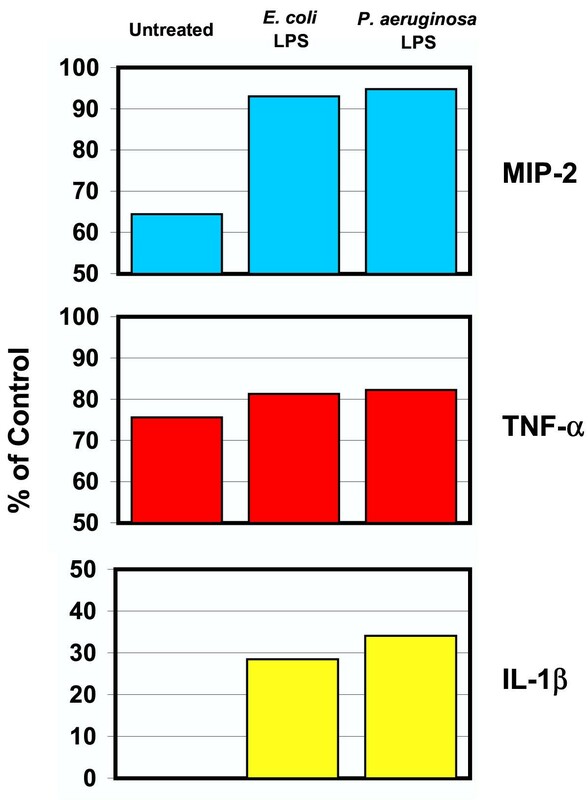 Semi-quantitative RT-PCR using specific primers for TNF-α, MIP-2 (CXCL2) and IL-1β showed that LPS treatment caused the amount of TNF-α mRNA to slightly increase compared to the already abundant levels found in untreated cells (figure 2 and 3). In contrast, there was a substantial increase in the expression of MIP-2 (CXCL2) mRNA and IL-1β mRNA following LPS treatment compared to control. Similar responses were seen when the cells were treated with LPS from P. aeruginosa (Figure 2 and 3). All visualized PCR product bands were of the expected size and nucleotide sequence confirming proper identification. Although the RANTES (CCL5) sample had extra bands of unknown origin, the band at the expected size of 205 bp had a nucleotide sequence that matched RANTES. RT-PCR for cytokine mRNAs Treated MGBE were exposed to 100 μg/mL E. coli LPS on the apical surface for two hours. GAPDH was used as an internal control to standardize starting mRNA quantity. This experiment was repeated twice with equivalent results. Semi-quantitative RT-PCR Semi-quantitative RT-PCR products from cytokine mRNA using MIP-2, TNF-α, and IL-1β specific primers. C is untreated control cells. Treated cells were exposed to 100 μg/mL LPS from either E. coli or P. aeruginosa on the apical surface for two hours. ARP was used as an internal control to standardize starting mRNA quantity. PCR cycle number used was between 22 for ARP and 31 for TNF-α. Densitometry analysis of semi-quantitative RT-PCR results Densitometry of PCR bands for MIP-2, TNF-α, and IL-1β (from figure 2) based on % of ARP control bands using ImageJ Program (Version 1.20s). The immunoassay experiments showed no detectable TNF-α in untreated MGBE or their surrounding media after 5 hours of incubation (limit of detection = 5.1 pg/mL). In contrast, following treatment with 100 μg/mL E. coli LPS the concentration of TNF-α protein in the cells was 33.6 pg per 106 cells in one hour (Figure 4). Intracellular TNF-α concentration reached a peak two hours after LPS treatment with a subsequent decrease by five hours. After two and five hours of LPS treatment, there was measurable release of TNF-α into the media of both the apical and basolateral compartments (figure 5). Three different species of LPS (E. coli, P. aeruginosa, and Klebsiella pneumoniae) stimulated TNF-α release in a similar fashion (figure 6). Treatment with 2 μg/mL E. coli LPS showed comparable results. None of the treatments increased lactate dehydrogenase in the medium compared with controls showing that the LPS treatments did not alter epithelial cell integrity (data not shown). LPS treatment also had no effect on the transepithelial permeability of these cells for up to 24 hours as measured by 3H-mannitol diffusion experiments when compared to controls (data not shown). Intracellular TNF-α following LPS treatment Intracellular TNF-α concentration of MGBE over time following apical exposure to 100 μg/mL E. coli LPS was measured by immunoassay. Values are the means ± standard error of results from three to four assays. TNF-α secretion into medium Release of TNF-α into the apical and basolateral medium by cultured MGBE exposed to 100 μg/mL E. coli LPS over time. TNF-α secretion was calculated as the total pg amount of TNF-α present in the apical or basolateral medium. Values are the means of triplicates ± standard error from a single assay. This assay was repeated twice more with similar results. Statistical differences between the concentration of TNF-α in the basal and apical medium were measured by paired Student's t-test (* = p < 0.01). Effects of LPS from different bacteria on TNF-α secretion Release of TNF-α into the apical and basolateral medium by cultured MGBE exposed to 100 μg/mL LPS from various bacteria for two hours. TNF-α was measured by immunoassay and calculated as the total pg present in the apical and basolateral medium. Each treatment was done in triplicate and assay repeated twice more with E. coli LPS and once more with P. aeruginosa and K. pneumoniae LPS. Values represent the mean of each treatment (n = 9 for E. coli LPS and n = 6 for P. aeruginosa and K. pneumoniae LPS) ± standard error. 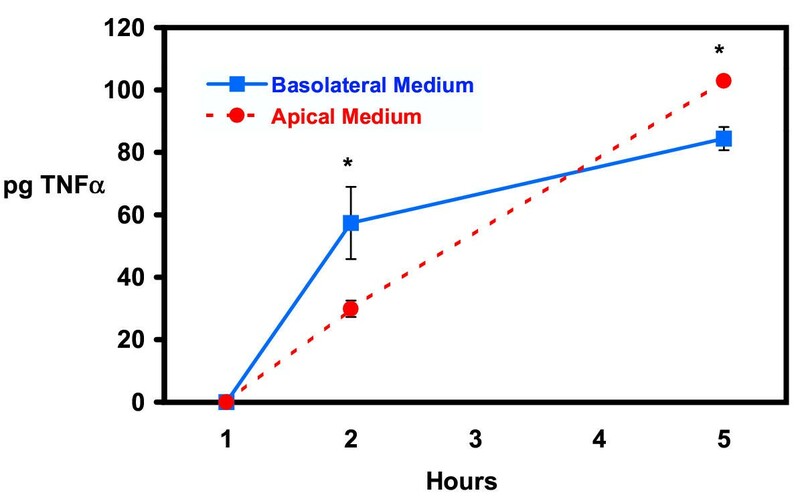 There was a statistical difference between the amount of TNF-α in the basal versus apical medium as measured by paired Student's t-test (* = p < 0.01). Bacteria are found in the bile of the gallbladder and bile ducts [15, 16], the presence of which may have relevance to clinical diseases such as stone formation [19–21], primary sclerosing cholangitis , and cholestasis [23, 24]. Direct exposure of sub-epithelial tissue to LPS from gram-negative bacteria causes release of cytokines by resident leukocytes and activation of macrophages . The biliary fluid of patients with cholangitis has increased concentrations of the inflammatory cytokines TNF-α and IL-6 suggesting that bacterial infection leads to an increase in cytokines released into the bile . Adding LPS to the bile of guinea pig gallbladders in vivo led to increased IL-1 concentration in the bile . What role biliary epithelial cells play in the response to bacteria in bile is not known. While most cytokine research has focused on cells of the immune system, other cell types produce cytokines including the epithelial cells of the lung [28, 29], retina , and intestines [31, 32]. Among the few studies involving the biliary system, it was demonstrated that cultured human intrahepatic duct epithelial cells produce functional IL-8 and MCP-1 (CCL2) [14, 33]. Isolated human intrahepatic epithelial ducts expressed immunoreactive IL-6 when treated with IL-1β or phorbal myristate acetate . Intracellular TNF-α mRNA and protein was detected in intrahepatic biliary duct cells in tissue sections , but not in cultured intrahepatic epithelial cells; therefore, there was no clear demonstration that biliary epithelium secretes TNF-α. Little research has focused on the ability of the epithelial cells of the extrahepatic biliary system to produce cytokines or chemokines. As described in this paper, MGBE were used as an in vitro model system of gallbladder epithelium to measure the endogenous production of cytokines and chemokines by extrahepatic biliary epithelial cells. These cultured cells consist exclusively of normal, non-neoplastic epithelial cells , without other cell types such as leukocytes ordinarily found in biliary tissues. The experiments showed that unstimulated MGBE express mRNA for TNF-α, MIP-2, and RANTES (CCL5). After treating the apical surface of the cells with LPS, the mRNA levels for TNF-α and MIP-2 (CXCL2) increased, while mRNA for IL-1β, IL-6, and MCP-1 (CCL2) appeared for the first time. Therefore, cytokines (TNF-α, IL-1β, and IL-6), a C-C type chemokine (MCP-1/CCL2), and a C-X-C type chemokine (MIP-2/CXCL2) are all up regulated at the RNA level by bacterial product interaction with the epithelial cells. The effects of LPS treatment for two hours on cytokine and chemokine mRNA expression clearly suggests that biliary epithelial cells can modify their own cytokine and chemokine production after bacterial challenge at the mRNA level. As with all in vitro cell systems there is the possibility that the cells in culture may have phenotypic changes to their cytokine profile compared to in vivo cells. In other parameters tested (i.e., morphology, mucin secretion, etc. ), these cells retain the normal phenotype of cells in vivo. Measurements of TNF-α protein showed that MGBE synthesize and secrete TNF-α when exposed to LPS, while untreated cells do not. This demonstrates that gallbladder epithelial cells themselves secrete a cytokine in response to bacterial products. The results from RT-PCR (showing a relatively high TNF-α mRNA expression levels in untreated cells which is only slightly increased by LPS treatment) along with the immunoassay results suggest that TNF-α mRNA is constantly present in these cells, but is not translated into protein until certain triggers are provided. This is consistent with the post-transcriptional regulation of TNF-α observed in other cells . In contrast, the mRNA of other factors, such as IL-1β, IL-6, and MCP-1 (CCL2) are not synthesized until the cells are stimulated, suggesting that their production is under transcriptional control. The protein expression of these other cytokines and chemokines along with the precise nature of the interaction between LPS and cell surface receptors warrants further study. While the exact role that gallbladder epithelial cells play in inflammatory and infectious diseases has yet to be determined, our research supports the hypothesis that gallbladder epithelium have some innate cytokine-producing capabilities in response to the presence of bacteria on their apical surface. The accumulation of TNF-α in the gallbladder bile of patients with cholangitis may be due in part to the apical release of TNF-α by biliary epithelial cells. In contrast, basolateral secretion of TNF-α could lead to a focal accumulation of TNF-α in the sub-mucosa of biliary tissue. Sufficient cytokine secretion could then stimulate the leukocytes in the sub-epithelial tissue, leading to inflammation of the tissue, without the need for the bacteria to pass through the epithelial barrier. The production of cytokines by gallbladder epithelial cells following LPS exposure demonstrates that biliary epithelial cells may be an active partner with the immune system in the detection of and defense against bacteria in bile. During sepsis, biliary epithelial cells could mediate biliary secretory function through cytokine and chemokine production. Dog gallbladder epithelial cells demonstrated increased mucin secretion following TNF-α treatment . In addition, exogenous TNF-α altered the absorptive properties of cultured human gallbladder epithelial cells . It is therefore reasonable to suggest that TNF-α produced by gallbladder epithelial cells in response to LPS could affect cellular function in an autocrine manner. Since mucin secretion and gallbladder transport properties play vital roles in cholelithiasis, changes in these parameters caused by endogenous cytokines and chemokines may promote stone formation. Epithelial-derived cytokines and chemokines also may alter biliary function leading to cholestasis. Gallbladder epithelial cells demonstrated distinct patterns of expression of mRNA for various cytokines and chemokines, and responded to treatment with LPS by altering their expression of certain cytokine and chemokine RNA and increasing TNF-α protein synthesis and secretion. The ability of biliary epithelial cell to control endogenous cytokine and chemokine production has important implications for biliary inflammation and diseases, such as cholangitis, cholestasis, and cholelithiasis. Thanks to Ilya Gukovsky for assistance with the cytokine mRNA assays and Dr. Don Ostrow for helpful manuscript assistance. This work was supported by a grant from the NIH (DK50246) and in part by the Medical Research Service of the Department of Veterans Affairs. CES participated in the design and coordination of the study, performed the immunoassay studies, and drafted the manuscript. TAB performed the RT-PCR studies. H-SC assisted in the immunoassay studies. S-KL initiated the immunoassay studies. SJP participated in the design of the RT-PCR studies. SPL conceived of the study, and participated in its design and coordination.